Coat Closet Makeover! A tutorial. I am very happy to report that the coat closet makeover is DONE!! I gave a little background on how my coat closet was my craft closet here and how it sadly had turned into the kids favorite place to shove everything! So it had to move. A while back I saw a picture on pinterest. 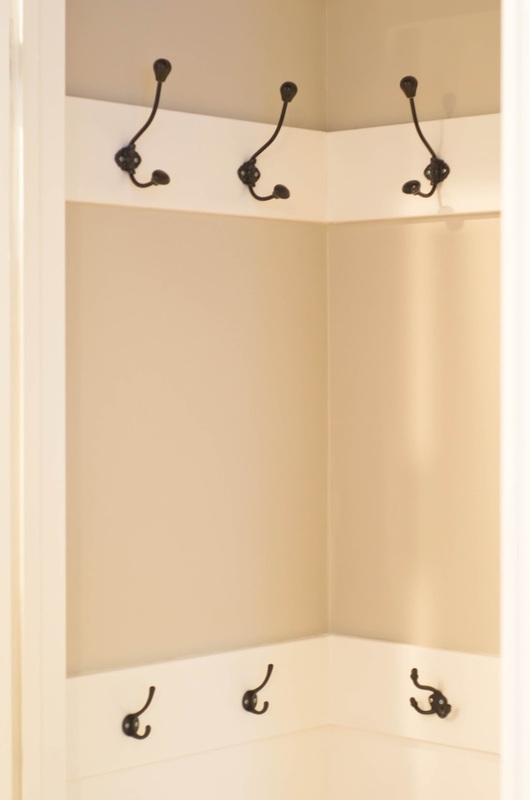 It was this beautiful and gorgeous coat closet that made me happy to look at. Sadly if you click on the picture pinterest doesn’t allow you to go to the page because it is either spam or some other inappropriate site so I won’t post it here (but if it is your closet PLEASE let me know! I’d love to give credit where it is due!). Nate did a lot of the work but I did a lot too so I’m going to show you what we did. We knew we wanted 2 rows of hooks and the wood we had bought was wider than what was originally there so we just put it over the top of the issue. Using his level and nail gun we got all the wood put in and ready for the next step. This picture is to show you that we also added a piece of wood to put a shelf high up in the closet. I wanted it high so it wouldn’t be seen and to hopefully prevent too much from being stacked up there but there are a few things I did want to keep in there that aren’t used too often so this was a good idea for us. We’ve got 3 rows of wood – 1 for the shelf and then 2 for the rows of hooks. And my pretty new baseboards. Once Nate got all the wood put in the closet became my job. I filled the nail holes and caulked all the seams and then painted all the wood white as well as the bottom 1/2 of the wall. After everything was painted white it was time to paint the grey. Have I mentioned my paint color yet? I am IN LOVE with it. It’s perfect for what I wanted. The color is an olympic paint and it is grey ghost. It’s beautiful, especially against white. It is a true grey but is not dark. I am so happy with my choice! All that about my paint color though needs to be thrown out because the color in the closet looks very off in these pictures, it is looking very beige and it is not. I’m hoping when I am ready to do the full front room reveal I’ll get a true picture of the color. We used 3 different styles of hooks. We got them all at Hobby Lobby. Hobby Lobby has all their knobs and hooks 50% off all the time now. Before the discount the top hooks were $4.99 each. The middle bottom ones were $3.99 each and the bottom side ones were $2.99 each. A much better price than we found at some other places and I didn’t have to paint them! 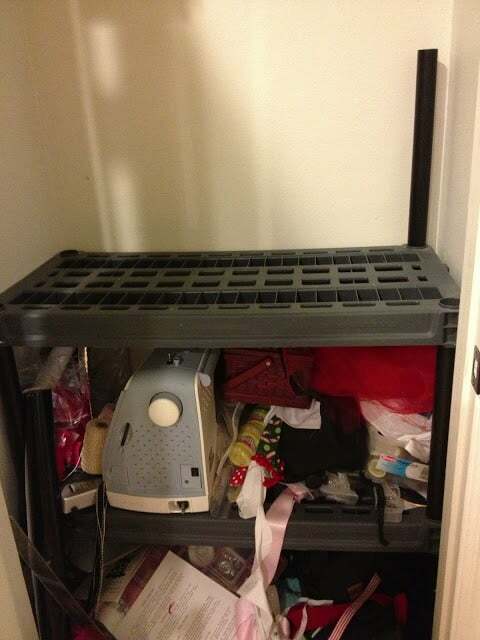 This picture is to show you the shelf up top a little bit. As you can see in the other pictures it can’t be seen if you’re just standing looking at the closet, at least what’s on it can’t be. 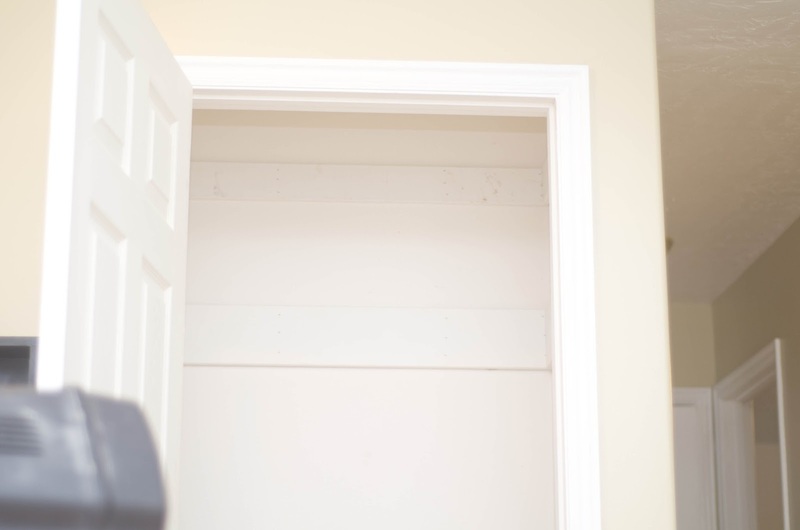 I’m beyond thrilled with how my coat closet makeover turned out. 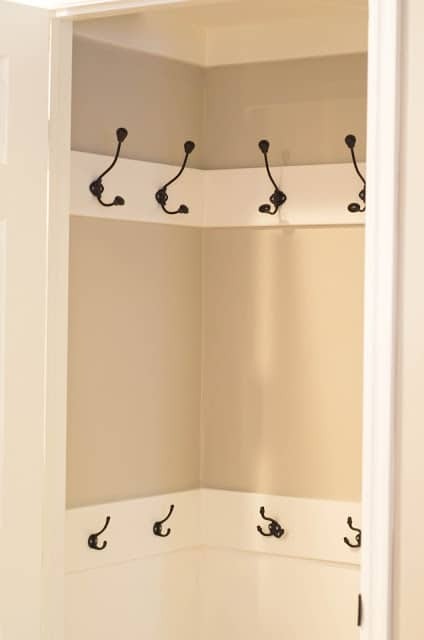 We used a total of 14 hooks so there is plenty of room to hang things but it also keeps the closet feeling open. The kids think I’m mean because I told them they have to take their stuff to their rooms still, that this is for me and guests, that didn’t go over very well :). 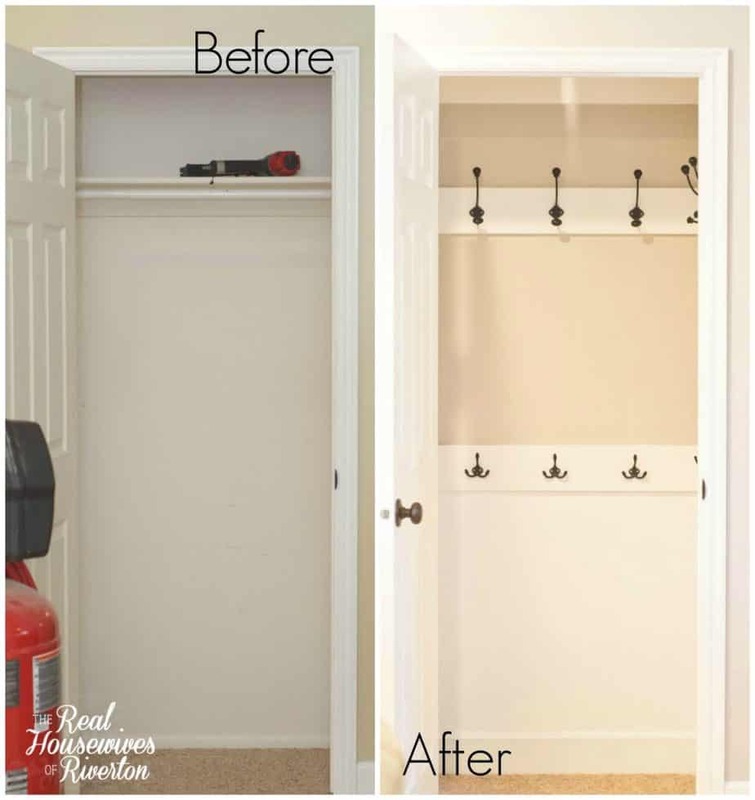 This coat closet makeover was very pocketbook friendly. 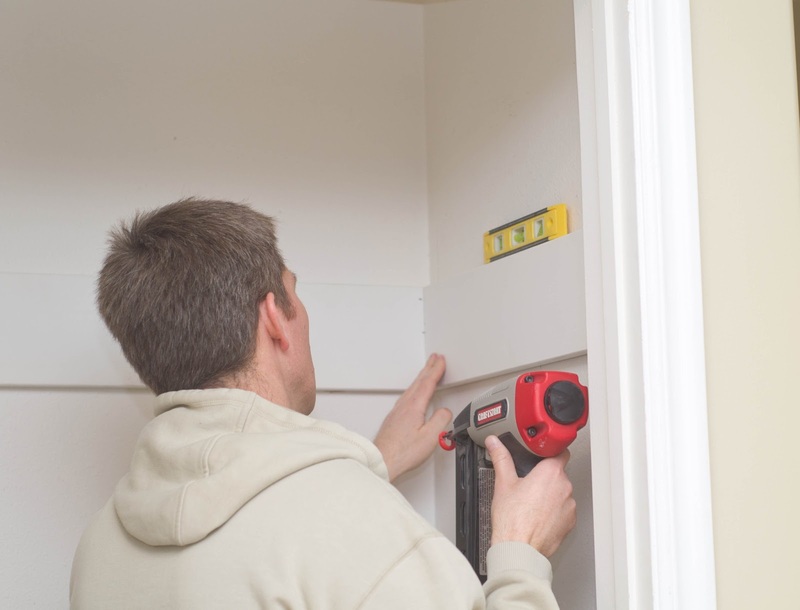 The hooks were the most expensive part and you can always cut back on that by using less expensive hooks or other things you have on hand (old knobs, hooks, etc…). The final step is to put the transfer piece on top of the carpet that covers the seam from the wood to the carpet. It was back ordered forever but is finally here so Nate gets to do that now. I hope you like the transformation as much as I do. We’re pretty proud of the end result! what does it look like with coats in it? let me see if I can find the photo I shared before. If not it’ll be tomorrow because it’s too dark for a proper photo right now. 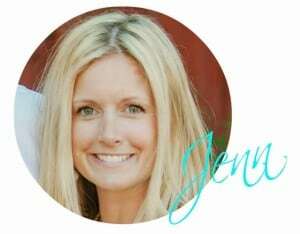 What a GREAT idea, looks awesome Jenn. That’s really nice! Looks great! Hello Ruthie! I’m late to the party but all linked up, thanks for the invite and the kind words. Hope you come back soon!! I founds this post and your blog through another blog i follow. I’m so glad I clicked through. 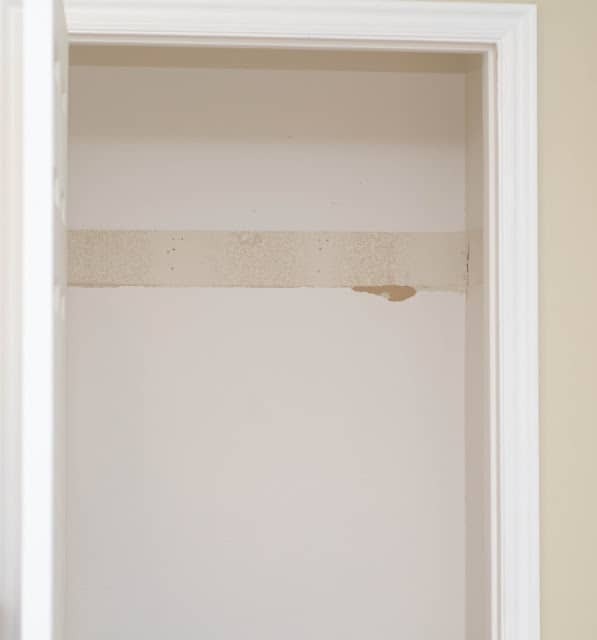 you had rough walls after removing the original wood and we currently have wire shelves that we hate, but when remove them there’s big holes left in the wall. Using a larger piece of wood to cover these holes is brilliant! thanks so much for providing me with this great idea! I’m glad we could help you!! I love my closet and hope you have great success with yours! wonderful idea… since it’s so pretty, did you take the door off? 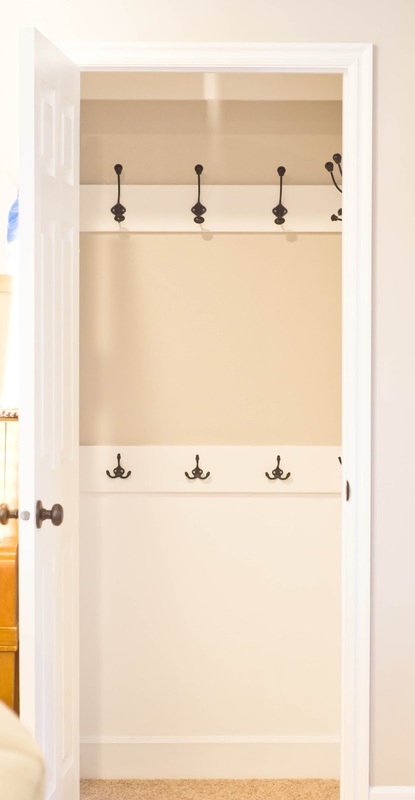 we have a coat closet just like this and i can’t wait to make it over! i’m thinking of taking the door of the hinges and leaving it open and like a nook. i also might make a little bench seat in it so guest can sit to put their shoes back on. what do you think? door on or off? Thank you. We left the door on because as much as I would LOVE to believe it will always look this beautiful (and it is still looking pretty good at the moment) I know there will be times when it has bags, shoes, etc… all over it. If you do the bench and stuff I would say door off would look lovely but our’s isn’t really big enough for a bench (it’s not quite a perfect square but close). I would LOVE to see your’s when you’re done! Thanks so much for your comment. Did you use composite board or ply wood? do you mean for what we hung the hooks on? The trim pieces are MDF. Hope that helps and thanks for stopping by! Thank you! Also, what nails did you use to attach the hooks to the wood? Did everything except for that this weekend. Thanks for the great idea!!!! I LOVE the way it looks! We used little screws. Nate just bought a bag of them at the store! Good luck and please share your finished project!! Thanks. Found you via Pinterest….I LOVE the idea of the storage shelf way up high!!! 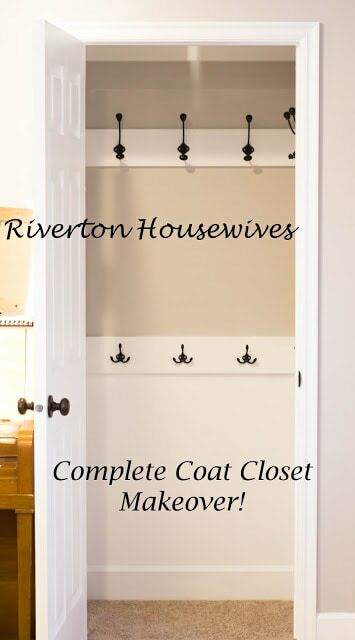 This is the makeover my coat closet has been dreaming of. you’re sweet! I hope you’ll share how yours turns out! Another great find via Pinterest…I’m doing this tomorrow. 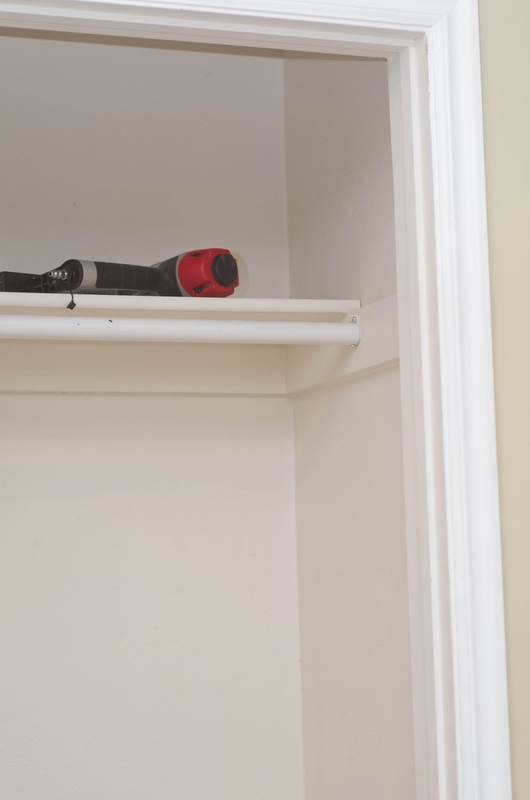 So, the hooks are hung on MDF boards? 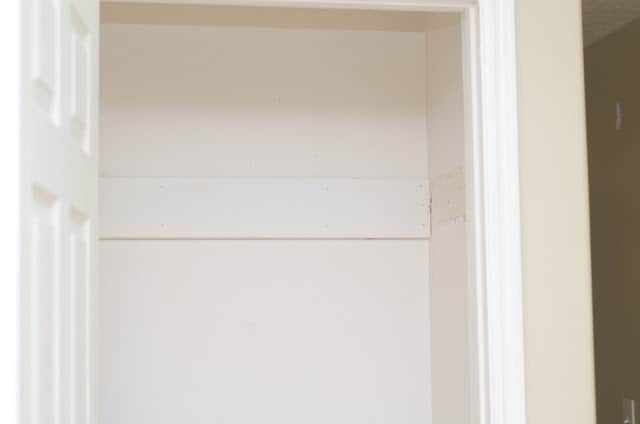 How did you attach the boards to the wall? 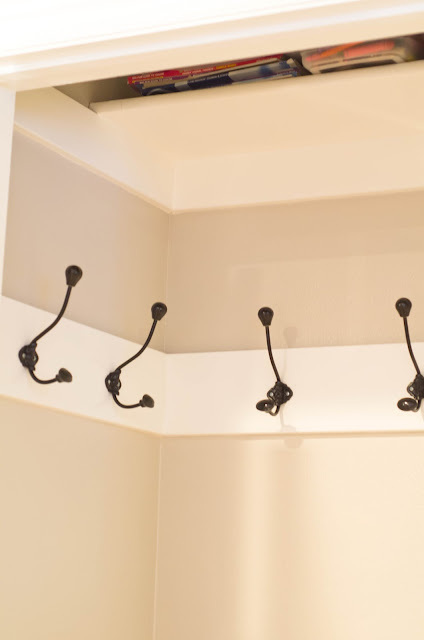 Just thinking all the coats on the hooks would be quite heavy…could you let me know your secret? Thanks! It is heavy but we’ve had no problems with them pulling out. 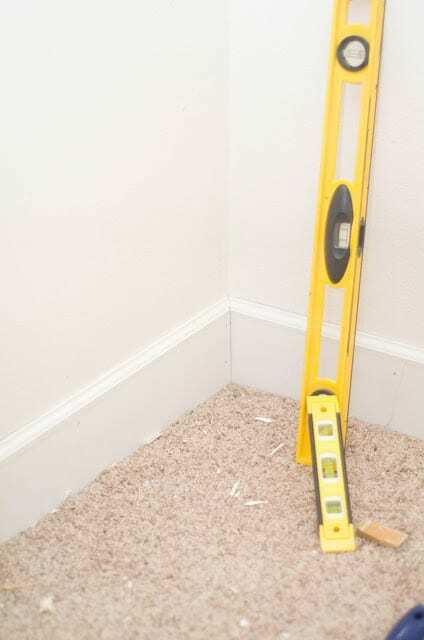 He used a nail gun (you can also use finishing nails and a hammer) and nailed it into the wall everywhere there are studs (on each end and at least once in the middle). Thanks for stopping by and I really hope you’ll share photos when you’re done! What types of boards did you use? I have a lot of 2×4’s that I’m trying to use up, and so I would like to use those if at all possible. What size board did you use for the way up high shelf? Thanks! What size of hooks did you use? thank you, just saw this on pinterest! 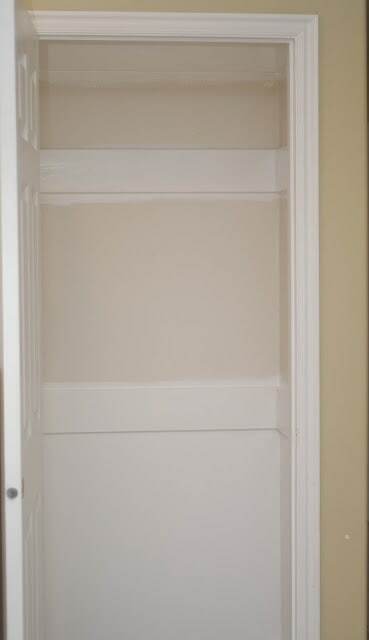 We gave a front coat closet too shallow to shut the door with coats hanging. This looks like it might be the perfect solution to keep it functional and have a door we can shut! 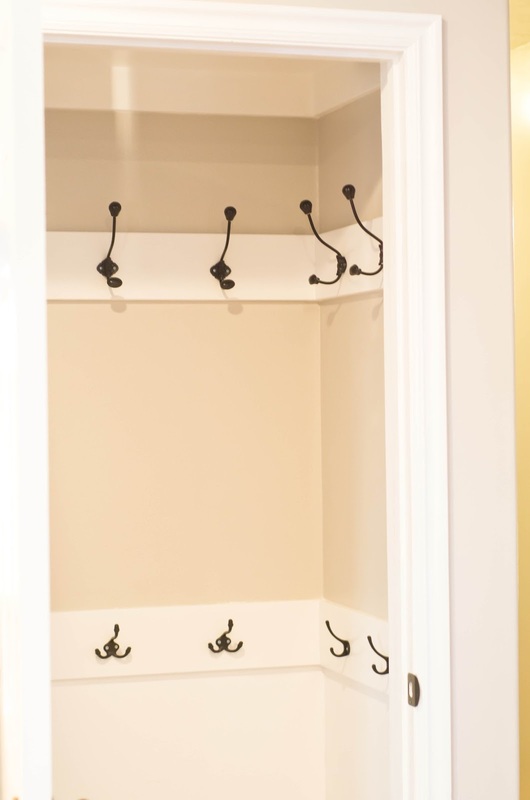 What are the dimensions of your closet? Awesome! 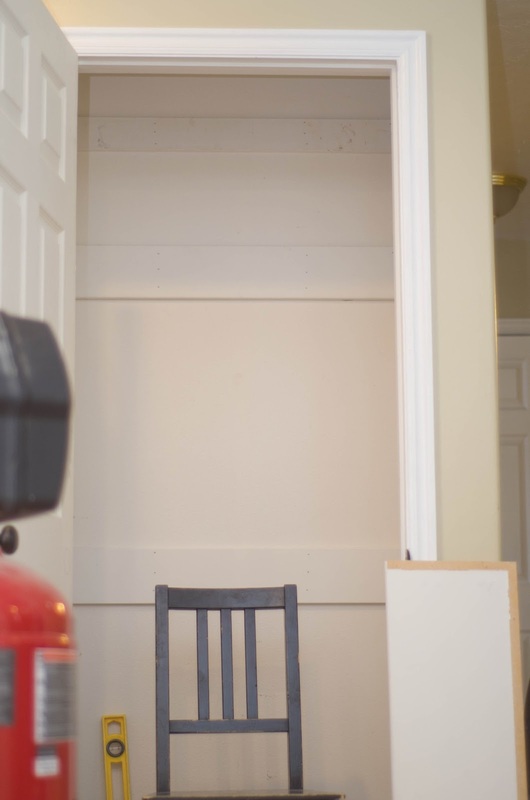 I’ll be referencing you in my post today, “What Greets Your Buyers When They Walk In the Front Door?” on http://www.homesandlivingblog.com Thanks for the awesome organization/de-clutter idea! I love how your closet turned out! 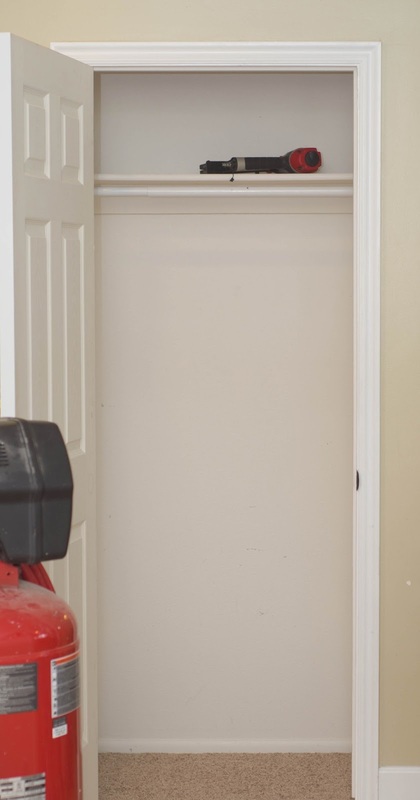 I would like to do something similar with mine, but need some ideas on what to do about the large space under the stairs. It always ends up being a big mess because of all the shoes and the fact that people just throw their stuff in. I love the hooks idea! At lest some coats might actually get hung up! Lol! How far apart did you space your hooks? I plan on doing this project this weekend and am wondering how many hooks to buy.